Belinda Trussell understands the importance of her tack’s function and appearance in the Grand Prix show ring. An accomplished Canadian dressage rider and trainer, Trussell has competed at two Olympic Games, the World Cup, and two World Equestrian Games. 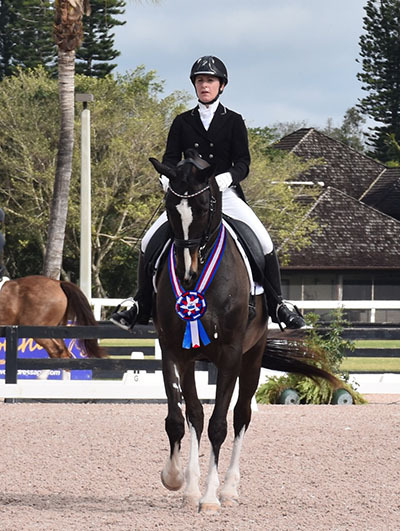 This past weekend at the Adequan Global Dressage Festival in Wellington, Florida, the stylish performance of Trussell and her equine partner, Tattoo, caught the attention of World Equestrian Brands, who awarded the pair with the World Equestrian Brands Tack Matters Award. World Equestrian Brands knows that high-quality, properly fitted, comfortable tack makes a difference in equine and rider performance. To reward horse and rider teams at the Adequan Global Dressage Festival who acknowledge the importance of tack, the company presents the World Equestrian Brands Tack Matters Award throughout the winter show series. World Equestrian Brands, the U.S. distributor of world-class products from Amerigo, E.A. Mattes, Equetech, Equilibrium, Hamag, ProChaps, and Vespucci, outfits some of the world’s top riders, including 2016 U.S. Olympic Dressage Team Bronze Medalist Allison Brock. This competition was Tattoo’s first national Grand Prix, and he showed great potential down centerline. The 14-year-old Westphalian gelding is owned by Belinda and her husband Mark Trussell. Trussell was elated with Tattoo’s impressive performance, which earned them a score of 71.100 percent from the judges and first place in a class of 13 competitors. World Equestrian Brands wishes Trussell and Tattoo success in their future endeavors, and encourages them to continue tacking up to win. As a sponsor of the Adequan Global Dressage Festival, the company will continue to present the World Equestrian Brand Tack Matters Award to elite horse and rider teams like Trussell and Tattoo, who demonstrate that functional and stylish tack make a difference in performance. World Equestrian Brands products can be found on the show grounds of the Adequan Global Dressage Festival at The Horse of Course’s mobile tack shop, and just around the corner from the show grounds at The Tackeria and Dover Saddlery. For more information about this premier distributor of high-quality equestrian brands, visit www.worldequestrianbrands.com.